I'm giving away THREE PAIRS of tickets to this year's Gourmet Food & Wine Expo VIP Preview Night on Thursday, November 20th, from 6pm - 10pm! Each pair of tickets is valued at $90. 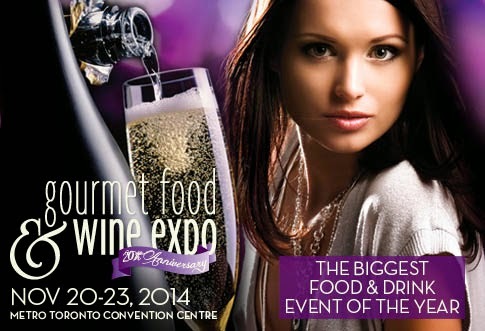 The 20th annual Gourmet Food & Wine Expo, held at the Metro Toronto Convention Centre (North Building), will take you on a food and beverage journey around the globe. Sip and savour your way through international gourmet cuisine, exotic delicacies, incredible wines, cutting-edge cocktails, stunning craft beers and much more. VIP Preview Night admission on Thursday, November 20th, offers a sneak preview amongst the city's most elite guests. It is the first night of the Expo and the first chance that attendees get to try the samples and see all the exhibitors. Contest starts on Sunday, November 9 and ends on Sunday, November 16 at 12PM. Three lucky winners will be chosen randomly from www.random.org and I will announce the winners on Sunday, November 16.